Light reactions occur when plants synthesize food from carbon dioxide and water, referring specifically to the part of energy production that requires light and water to generate electrons needed for further synthesis. Water provides the electrons by splitting into hydrogen and oxygen atoms. The oxygen atoms combine into a covalently bonded oxygen molecule of two oxygen atoms while the hydrogen atoms become hydrogen ions with a spare electron each. As part of photosynthesis, plants release oxygen -- as a gas -- into the atmosphere while the electrons and hydrogen ions or protons react further. These reactions no longer need light to continue, and are known in biology as the dark reactions. The electrons and protons pass through a complex transportation chain that allows the plant to combine the hydrogen with carbon from the atmosphere to produce carbohydrates. Light reactions -- light energy in the presence of chlorophyll -- splits water. Splitting water into oxygen gas, hydrogen ions and electrons produces the energy for subsequent electron and proton transport and provides the energy to produce the sugars the plant needs. These subsequent reactions form the Calvin cycle. Green plants that use photosynthesis to produce energy for growth contain chlorophyll. The chlorophyll molecule is a key component of photosynthesis in that it is capable of absorbing energy from light at the start of the light reactions. The molecule absorbs all colors of light except green, which it reflects, and which is why plants look green. In light reactions, a molecule of chlorophyll absorbs one photon of light, causing a chlorophyll electron to transfer to a higher energy level. The energized electrons from the chlorophyll molecules flow down a transportation chain to a compound called nicotinamide adenine dinucleotide phosphate or NADP. Chlorophyll then replaces the lost electrons from water molecules. The oxygen atoms form oxygen gas while the hydrogen atoms form protons and electrons. The electrons replenish the chlorophyll molecules and allow the photosynthesis process to continue. The Calvin cycle uses the energy produced by the light reactions to make the carbohydrates the plant needs. The light reactions produce NADPH, which is NADP with an electron and a hydrogen ion, and adenosine triphosphate or ATP. During the Calvin cycle, the plant uses NADPH and ATP to fix carbon dioxide. The process uses the carbon from atmospheric carbon dioxide to produce carbohydrates of the form CH2O. A product of the Calvin cycle is glucose, C6H12O6. The end of the electron transportation chain that gives plants the energy to form carbohydrates requires an electron acceptor to regenerate the depleted ATP. 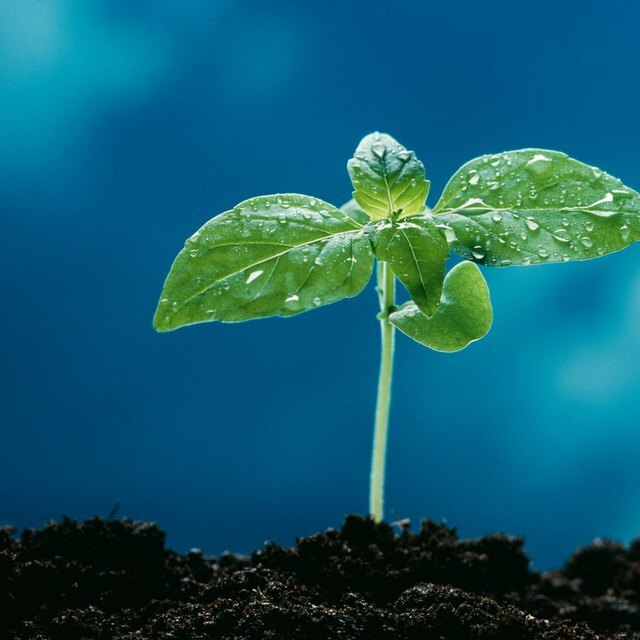 At the same time as they engage in photosynthesis, plants absorb some oxygen in a process called respiration. In respiration, oxygen becomes the final electron acceptor. In yeast cells, for example, they can produce ATP even in the absence of oxygen. If there is no oxygen available, respiration can't take place and these cells engage in another process called fermentation. In fermentation, the final electron acceptors are compounds that produce ions such as the sulfate or nitrate ions. In contrast to green plants, such cells require no light and the light reactions don't take place. Markgraf, Bert. "What Provides Electrons For the Light Reactions?" Sciencing, https://sciencing.com/what-provides-electrons-for-the-light-reactions-13710477.html. 23 March 2018.